When making a statement, sometimes the simplest messages are the best, as brilliantly shown in the Keen Company's quietly powerful revival of A.R. Gurney's 1991 play The Old Boy, the story providing a strong reminder of a time not that long ago, and packing as powerful a wallop as when it was first produced on stage. Sam (Peter Rini), a rising political star who is probably going to get the Republican nomination for governor, has abruptly changed his schedule to give a commencement speech at his former prep school, said institution located in New England. His decision made much to the consternation of his political speechwriter and trusted right-hand man Bud (Cary Donaldson), who wants Sam to distance himself from his preppy, a.k.a. privileged, past as much as possible. Upon reaching the school, Sam is surprised to find Harriet (Laura Esterman) the mother of his old school chum Perry (Chris Dwan) waiting to see him. Sam was the "Old Boy" to Perry, a prep school tradition where a new student is placed in the care of an older one in order to help the new arrival get used to the school. While Sam and Perry became great friends, the two eventually lost touch and Sam is shocked to hear Perry has since died. Harriet plans to give the school a huge bequest in her son's memory and wants Perry to mention the gift in his upcoming speech. Also with Harriet is Perry's widow Alison (Marsha Dietlein Bennett), a woman who used to date Sam before Perry came into the picture. However Sam soon discovers, after the ever-suspicious Bud does some fact-checking, some rather startling facts about Perry and how he died; the genesis of which is explored in flashback sequences where Perry is revealed to be an earnest and sensitive young man with a passion for music and acting, but who is pushed into sports by Harriet, who turns out to be quite the domineering mother. It's a path which Sam also urges Perry to follow, seeing athletics as a manlier thing to do. There is also the question of Perry's possible homosexuality, a subject his mother refuses to discuss or even consider, a topic which at the time, was also completely repellent to Sam. As the audience is offered glimpses of just who Perry was, the present-day Sam begins to question not only how he treated Perry back then, and the part he played in bringing Perry and Alison together, but also his own future path and the driving ambitions he has held for so long. Ambitions which probably destroyed his first marriage and are about to end his second. As Gurney notes in this intimate and somewhat time-capsule of a tale, there are consequences in every action one takes. A reality both Sam and to a lesser degree many of those around him are finally forced to acknowledge. What makes the story so affecting is that the characters come off not only as real people, but also as symbols of attitudes that were prevalent in the time show was set and which still exist today. This is personified best in the strong performance by Rini, his character not so much a bigot but rather one quite probably ignorant of a lifestyle he knew nothing about other than what he was told in locker rooms or local bars. Sam was also much more concerned with his own self-interests, often treating people like pieces on a chessboard to be moved as per his whims. It's not until Sam takes a good look at the man he was that he understands his role in it all and delivers a speech that is both elegant in its simplicity and quietly shattering. Also doing a great job is Esterman as Harriet, one of those mothers from hell, going from being just a tad overbearing to someone determined to protect her son's memory, and her own illusions at any cost. Bennett is fine as Alison, a woman who may have a bit of a drinking problem and who realizes her entire life has been based on a lie. There's still an attraction between her and Sam, but it may be undone if she learns just how much he figures into events in her own past. Donaldson is good as Bud, trying to juggle his own personal life with his belief in Sam and wanting to push him along politically to the very top. Tim Riis Farrell does a nicely subdued job in the role of Dexter, an Episcopal Minster at the school. Dwan cuts an appealing figure as the conflicted Perry, a boy whose inner turmoil becomes more and more apparent as the play progresses. Jonathan Silverstein's direction is excellent, keeping the story moving nicely and effortlessly blending the flashback scenes with the present day moments. 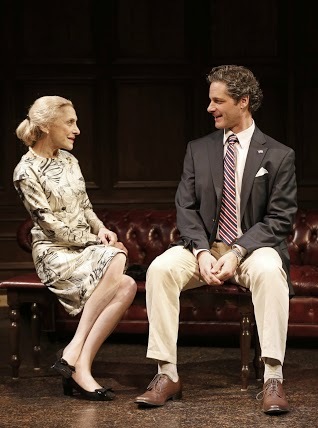 Steven C. Kemp's set of the suite where Sam stays on campus is nicely opulent without going overboard, and the costume by Jennifer Paar are appropriate to the setting. Timely and effective, The Old Boy is a work that deserves to be seen. Both for the production itself and as a lesson to all aspiring playwrights that when making a statement, sometimes a few choice sentences can be much more effective than entire paragraphs devoted to the issue.